Editor’s Note: When is a Mind Map not a Mind Map? ‘The Mind Mapping Community is still quite young, but it has come a long way since Tony Buzan popularised the term in the 70’s. It has even evolved into something quite different to what he originally imagined. His laws are quite simple and very good. You can produce amazing Mind Maps, if you follow his principles. In fact, my first 100+ Mind Maps followed Tony Buzan’s principles 100%. 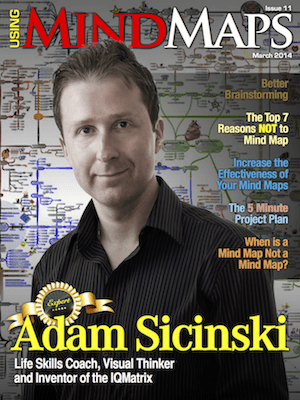 I wrote about his Mind Mapping principles in an earlier issue and you won’t do any harm by learning and knowing them. Yet, many Mind Mapping experts at BiggerPlate Unplugged Events produce Mind Maps that differ (sometimes radically) from the original Mind Map Principles. These points are often the focus of much, often heated, debate. ‘I’d like to share some of the lessons I’ve learned during the past 6 months, working with my Mindjet Content Dashboard.